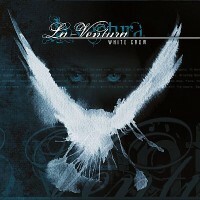 LA-VENTURA is a Dutch Groove/Gothic Metal band, formed several years ago. They released their debut album, “A New Beginning” in 2007. You can read my review here. At the time Erwin Polderman (ex-ORPHANAGE), co-founder with vocalist Carla Douw, sat behind the drumkit. To get the name out and in support of their first album, the band played several gigs. I also had the pleasure of seeing them at work in that same year at Meadow Fest in Wachtebeke, Belgium. See here. LA-VENTURA not only convinced on CD, they deliver the goods live as well. A few years ago, however, it got silent around this new and promising band. The last news was the self-released EP “Breaking The Silence”, which contained 3 new songs. Last year the band was back with full force and played a.o. at Mike De Coene’s birthday bash (together with ENDLESS CYCLE, INCARNATE and ROXXCALIBUR). Mike is the man behind Hard Life Promotion. Of course I was there and I can assure you, it was great. The band still provides Groove Metal in which Carla’s clean vocals clearly contrast with the guitar. Fast-forward to 2013: The second album is out, and this since March. As no new label home has been found (yet), the band had to opt once again for a self-release. “White Crow” contains 10 new tracks, of which 2 were previously released on the EP: “White Crow” and “Human Vanity”. I don’t know if the band changed anything or if they re-recorded the songs as they were. With regards to the album title: I wonder why it’s a crow and not a raven (despite both belonging to the same family), as the saying (at least in Dutch) speaks of a (white) raven to indicate something rare. That aside, let’s go through the songs, starting with “Falling Down”. This one takes off instantly with the typical grooving guitar and a breakdown piece. As said before, Carla’s clean vocals contrast with the heaviness of the music, but it works quite well. Also, the singing sounds powerful and harmonious. Electronic touches in the back makes the song not just more melodic, but also complete. The chorus is very catchy and lets the music flow. The melodic aspect is delivered (mainly) via the vocals and this is a splendid manner. The following bridge, however, shows a more emotional side of the song. As accessible as it all is, LA-VENTURA manages to keep things interesting and diverse. Drums, a little later joined by the guitar, start “Human Vanity”, laying out the main rhythm. Vocals are added after a little while, during which the guitar and rhythm section continue the groove. All advances steadily, with bursts, and so towards the chorus, which is a straight-forward one. Again melody and catchiness are key elements. And check those vocals! I simply love this part. Carla’s vocal sound reminds somehow of Mya Mortensen from the Croatian band OMEGA LITHIUM. See, for example, this video of “Stigmata”: click here. “Human Vanity” is a more linear song where the vocals are the center of attention. The last part does offer a nice groovy, instrumental moment. Another accessible song, yet kicking in from the first second is “Close To You”. This is all about guitar dominance in the verses. Melodic leads work from the back. The chorus is, compared to the other songs, more Poppy, and a tad slower. “Song For An Idiot” has more drive. Also included: a screamy guitar under the main grooving one. And backing keyboards. All this leads to the verses, where, yes, the guitar is boss. Drums follow a simple pattern. The singing is also a bit different, in that Carla sings lower and that’s a good thing, for it flows well with the music and overall feel. The whole has something Gothic Rock-like. Emotions are important, and so you need a symphonic input. There’s also room for a solo and an instrumental piece (delivered by the keyboards). The title track begins slow and atmospheric. The piano is the main instrument, but be prepared, as melancholic, grooving music is not far away. The verses are atmospheric, yet ballsy. This is almost similar to (old) MACHINE HEAD. The chorus is where all comes streaming out, all emotions are let loose, and the vocals again contrast with the guitar. But it sounds very good. Sort of continuing this style is done in “Drowning”, which has more modest, humble verses. Full force and energy are reserved for the chorus. Symphonic keyboards do their thing, while melodic touches decorate the song a bit more. What those sounds are, I can’t tell, but glass is the first thing that came to my mind. The drums remain quite linear, almost invariable throughout the entire song. “Time And Time Again” attacks violently. Full streaming and melodic additions can be found in the chorus. Also worth mentioning is the melodic break/bridge. Another heavy groove-laden song is “Neverending Story”. Is this based on Michael Ende’s classic book? In any case, it’s a powerful song with a catchy, yet simple chorus. The rhythm is the center of attention here. During the verses there’s a nice melodic layer in the back. “The Only One” begins like DISTURBED’s “Down With Sickness”. Not the same start, but it sounds similar. After that, all is let loose and unfolds into a Funky piece of music. Dark, electronic verses contrast with the chorus, where the music may flow freely and the vocals may soar. Over halfway the solo breaks the song in two, after which it’s back to business. Last but not least, there’s “Watch Me Go”, which offers the same as before: heavy, grooving/chugga guitar riffs. All is unchained in the chorus. Another accessible song, but good. The repeating of the chorus as the end nears is a little over the top. It’s as if the the band didn’t know how to fill those last moments and decided to just put the chorus on repeat. Perhaps a fade-out would have been better to avoid hearing this part 10 times (by manner of speech). Long story short: The band has been off the map for a few years and you could wonder if there ever would be a second album. And look, a new drummer, new inspiration, new energy… all leading to “White Crow”. On the album, LA-VENTURA confirm they are a solid band, they deserve their place on the map and on the various stages in Europe and around the world. Aside from details, all is plus: musicianship, production, vocals (or does that fall under musicianship?). The band is back, indeed, stronger than before. Thus, “White Crow”… Heavily recommended, I say!